It is important to keep your tack safe, after all tack is probably something you want to buy only once and can be very expensive. Keeping tack safe can just be a matter of taking a common sense approach to security. Take a step back from your daily routine, look through the eyes of a potential thief and then think how would I steel my own tack? The most popular equestrian items to be stolen are items of Tack, Bridles, Saddles etc. Small items can easily be carried away and these are usually unidentifiable and can also be easily sold on. Consider keeping your Tack safe by locking it away out of sight. Don’t leave wheelbarrows lying about, after all these can be used by a thief to help them carry away the tack. 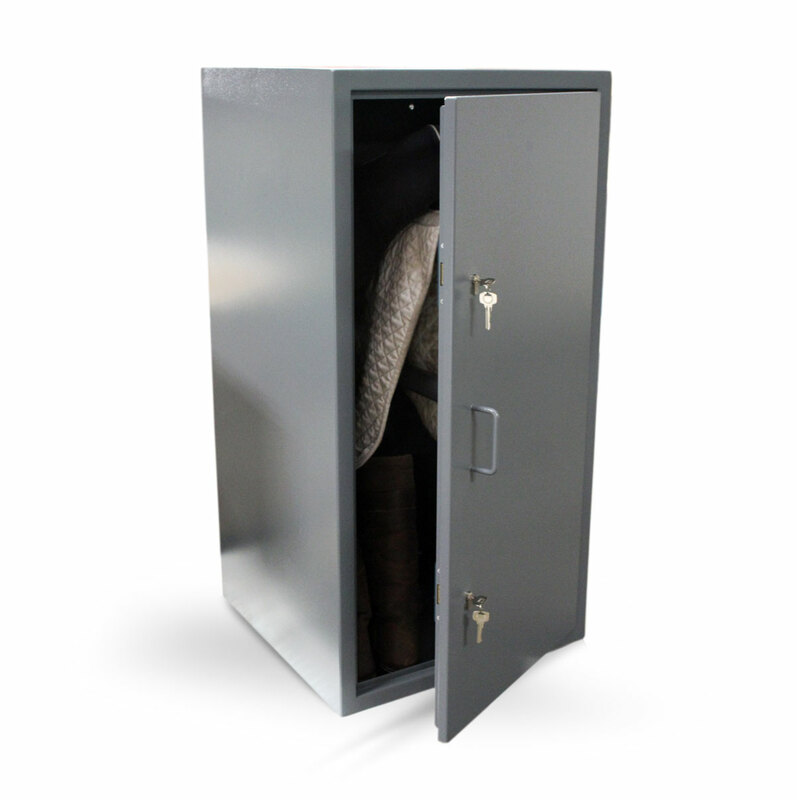 We manufacture a range of tack safe units which will keep your tack safe and secure when you are away from your yard. Make sure you don’t leave your tack unattended, it’s easy to forget and leave it out “just while I put the pony away” and when you return it’s not where you left it! Don’t forget to keep tack safe at shows too, it’s easy to have tack stolen there as well. If it’s your yard, then you can install additional security measures to deter a would be thief. Good security lights, PIR (motion detectors) linked to a LED lights will only come on when they detect movement, these are excellent and now with LED units fitted have low running costs. Steel bars on windows and good door locks are also an excellent deterrent. However good locks are only good if they are, locked that is! If it’s not your yard you can pester the owner to install those items mentioned above or install your own security measures, like our tack safe. If you have a visitor that comes to your yard, perhaps asking for directions or some other seemingly innocent reason be a little suspicious. Don’t be fooled, it might be that they are not there for what they say they are and are just looking around with a view to seeing the lay of the land. It’s not unheard of for people with tack advertised for sale to have someone call to look at the tack only for it to be stolen the following day. If you do have tack advertised for sale make sure that you show it to interested parties in a place different to where it is usually stored. This way if the viewer is not what they seem they cannot return and steel it from where they have seen it kept. It’s also a good idea to slip into the conversation that you keep your tack safe and are keen on security without telling them how you achieve it. This will deter any would be thieves. Be safe, keep your tack safe and be vigilant.